This Museum houses the oldest trading ship known to us with her cargo, which was raised from the bottom of the sea. The ship sailed in the Mediterranean during the life time of Alexander the Great and his successors. She sank in open waters less than a mile from the anchorage of Kyrenia. The evidence point to her being taken by rough seas around the year 300 B.C, when she was rather old. Michael Katzev of the University Museum of Pennsylvania directed a team to survey the coast of Cyprus for shipwrecks in 1967. In Kyrenia a sponge diver took the team to the site. Using a metal detector, protonmagnetometer and probes, the group spent a month surveying the site to find the ship and the cargo over an area measuring 60 x 30 feet. During the summers of 1968 and 1969 the expedition consisting of 50 under water archaeologists, students and technicians employed stereo-photography and other developed techniques to record the position of each object before they were raised. Then the ship's wooden hull which was well preserved in the sand mud was "mapped" labelled and lifted in pieces to the surface. The objects in the museum are the original ones carried on her during her last voyage about 2300 years ago. From them we can learn about the life of those traders. More than 400 wine amphoras, mostly made in Rhodes, consist the main cargo, and they indicate that the ship made an important stop at that island. On the other hand, ten distinct amphora shapes on boar show a different port of call, such as Samos in the north. Another part of the cargo of the ship was perfectly preserved almonds, 9000 in number, which were found in jars and also amassed within the ship's hull. The 29 millstones, laden on over the keel in three rows, were being transported as cargo, but at the same time serving as ballast. At the stone quarry, probably on the island of Kos, masons carved letters of indentification on the sides of these stones. From all these it can be assumed that the ship sailed southwards along the coast of Anatolia, calling at Samos, Kos and Rhodes before continuing eastwards to her destruction in Cyprus. That the sailors fished during the voyage is clear from more than 300 lead net weights left in the bow. Meals were probably prepared ashore, using large casserole pot and a bronze cauldrons. Four wooden spoons, four oil jugs, four salt dishes and four drinking cups recovered in the shipwreck suggest the number of the crew on the last voyage. The ship's single sail had been taken down before sinking since in the stern were found more than 100 lead rigging rings from a large square sail stowed there. 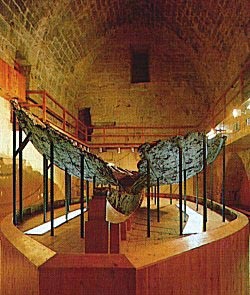 The wooden hull, build mostly of Aleppo pine, was preserved for a length of almost 40 feet, originally measured 47 feet long by 14 1/2 across. She sailed at 4 to 5 knots. The ship was built in the "shelfirst" manner, quite the opposite of today's method. Rather than building a skeleton of ribs first, her outer planking up from the keel was constructed and then the ribs were laid in and these were secured with cooper spikes. The ship was intended for long service and underwent many repairs. In the last reparation a skin of lead sheathing was applied to her body to keep the old ship waterproof. Carbon 14 analysis of the almonds points to a date of 288 (plus or minus 62) B.C. and the tees out for the ship planking 389 (plus or minus 44) B.C. Hence, the ship was more than 80 years old the day she sank. Preservation and conservation of the ship began in 1970 and lasted four years. The great part of reasamblage was completed after the Turkish Peace Operation and finished in the year 1976. The last contributions were made in order to finish the project and to open it as a cultural service for the world. Our thanks are due to the University Museum of Pennsylvania and other institutions which gave generous funds for the project and especially to the director Mr. Michael Katzev and to the members of the project.